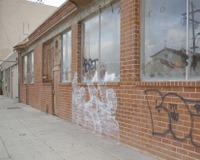 The Neighborhood Watch listed a number of concerns, one of which is the increased tagging of buildings. The form and composition of graffiti and street art has support in the Arts District and the works of Mr. Cartoon, Relic, Man-One and Shepard Fairey share the streets with each other. However, that support is dwindling fast as tagging is on the rise by gangs or worse, suburban art students. The porus brick wall of this future gallery at Third and Traction were hit again at 2am. The owners of the building had hoped to keep the brick work exposed after spending three weeks sandblasting off layers of paint, but the tagging may force them to paint over the brick wall for good. This recent tag comes after local residents emailing resolve to watch out for any tagging and even street stencil artists. Last week two taggers were being watched from one rooftop. Last night's taggers, as witnessed by someone in a nearby loft, ran with their paints stuffed into a bag to a waiting gray car. The email goes on to say the "rich kids" were almost caught. If a tagger is seen at work, you can call 911. What's worse for taggers, the completed work seen in public view will be criticized because in this neighborhood, poorly done art is also an offense. Here, the visual spam on brick shows no depth of purpose or perspective with it's weak strokes of white, or the adjoining piece with black keylines. Both lack skills compared to the complex abstract typography found on industrial exteriors around the Arts District. The only sense of rebellious danger is how these taggers were brave enough to get out of the car to subject the public to a low level version of an art form. As one person states that tagging is due to gangs, not artists. But to attribute it just to an increase in gangs is not accurate. Some taggers who were recently caught were indeed art students from out of town, driven in by a BMW to a site they were eyeing to mark. And in conversations with both graff artists and taggers, empty walls are seen as potential extended canvases. Established graff artists tend to respect space. Taggers don't. Also, while we agree there would be gang tags anywhere––in this neighborhood some of the tag/graf art not on consenting walls aspires to be art, not territorial markings. One commentor writes "It' s Art...and art is nothing more than another visual way to communicate." However, as the "medium may not dictate the content" as in writing and art, the intent does dictate what's being communicated. You assume tagging wants to be part of that bankrupt world of the "art critic". I assume that graff artists who use galleries to highlight their work and in turn empower younger artists, and work with building owners to have a place to show off their good stuff––don't want taggers who are unable to follow through on traditions set by a neighborhood who offer street artists a place to be seen, and not be labeled JUST as a gang member, to make it difficult to have space available for experimental work. This sometimes art critic–-who is not yet corrupted––would hope that a neighborhood who tries to respect work at all levels, doesn't have to clean up after those who don't respect their own art form. As a cultural critic yourself (and bloggers are seen as bankrupt OPed disengaged from real discourse just so they can rant and rave) you spoke a lot of truth when you once wrote: "Despite all the architecture schooling (SCIArc) they provide, the best design for a desk/work area a student could dream up was some trashy mix of stolen LA City street signs and barricades. It costs a lot of money for fancy kids to learn the practical skills of the destitute. Still, the poor do it better." Let the good work thrive. Let the crap work that prevents good work, to thrive somehow stop, or at least be noticed when it's not the best. Anyone see the tagging all over the North side of 4th street between Main and Spring this weekend?